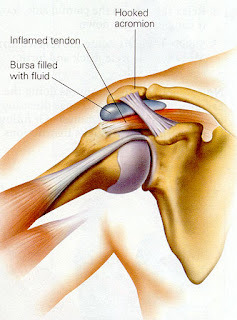 The shoulder impingement, although is more common in older population, it is also increasingly common in athletes whose sports involve repetitive overhead motions (tennis players, pitchers, throwing sports, volleyball, swimmers), which is sometimes severe enough yo cause awakening in the night. The term impingement refers to a mechanical compression and/or wear of the tendons of the rotator cuff. The rotator cuff includes a series of four muscles that connect the scapula to the humeral head, and are important to maintain the shoulder joint stable and contributes to shoulder strength during activity. Normally, the tendons of the rotator cuff glide smoothly between the acromion (part of the scapula) and the humeral head, helped by a lubricating sack (subacromial bursa) that reduces the amount of friction. The space between the acromion and the humeral head space is called subacromial space. Any cause that compromises this smoothly glide leads to an impingement, such as weakening and degeneration of the tendon due to aging, formation of bone spurs and/or inflammatory tissue in the subacromial space, and overuse injuries, due to repetitive activities above the head. The tendons of the rotator cuff rub between the head of the humerus and the acromion when we use the hands above the level of the head or when the arms are held out to the side of the body. This can become a chronic inflammatory condition that may lead to weakening of the tendons of the rotator cuff, which may result in a torn rotator cuff. According to Neer, there are three stages in the rotator cuff impingement. Stage I is more common in patients younger than 25 years, and is described by having acute inflammation edema and hemorrhage in the rotator cuff. This stage is reversible with physical therapy. Stage II is usually seen in patients from 25 to 40 years old and is a progression from acute edema and hemorrhage to fibrosis and tendinitis of the rotator cuff. This stage may not responde to conservative treatment and may require surgical intervention. In stage III there is a mechanical disruption of the rotator cuff tendons and changes in the coracoacromial arch with osteophytosis along the anterior acromion, affecting patients older than 40 years old. This stage commonly requires surgical anterior acromioplasty and rotator cuff repair. Nevertheless, both stages II, when surgical operation required, and III need physical therapy after surgery to reduce the pain, to increase the range of motion of the shoulder, to stretch and to strength the shoulder musculature.